and advocate for the profession! When I saw this art work in a pin on Pinterest, I knew I wanted to make a bulletin board in the same realm. I had already decided that we would be focusing on heroes and heroines this year, and this fits perfectly. Of course, my board doesn't do justice to the original artwork, which I really want to buy for my office. I had a lot of fun using art and pre-cut papers from an art store (discounted, of course! ), various shades of crepe paper from our workroom stash, and even silver star stickers! Students and staff seemed to enjoy it, as well. Before the year began, our character ed team met to discuss the overarching themes for the year. We decided that a visual would help students to remain focused on the traits they could develop throughout the year. 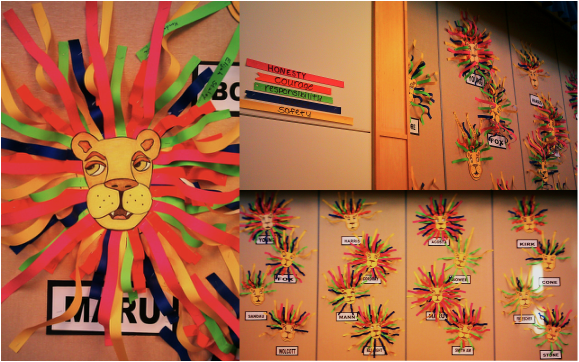 Eventually, we thought of our school mascot, a lion named MaRu (short for our school name: Mabel Rush). Each classroom would be given a lion head, and the mane would be developed throughout the year. As students displayed a character trait, they earned a colorful strip of paper matching that trait. For example, if John brought in all the playground equipment without being asked, he would earn a green Responsibility strip for his classroom's mane. The amazing and talented music teacher, Mrs. McKinnon, created all 24 lion heads (if you look closely, each lion's face is unique in expression and colors!). They were posted on the wall of our cafeteria, with each teacher's name posted below. Students have written their names and behavior that displayed the trait onto each strip they've earned. As you can see, students and teachers have really taken to this display! It has proven to be an excellent talking point and motivator with students, as well. It's rewarding to capture the character of students- prominently displayed for all to see- and to watch students take real pride in their positive choices!